In March 2018, WFCO sponsored the release of “The Economic Status of Women in Colorado” fact sheet, researched and written by the Institute for Women’s Policy Research (IWPR). 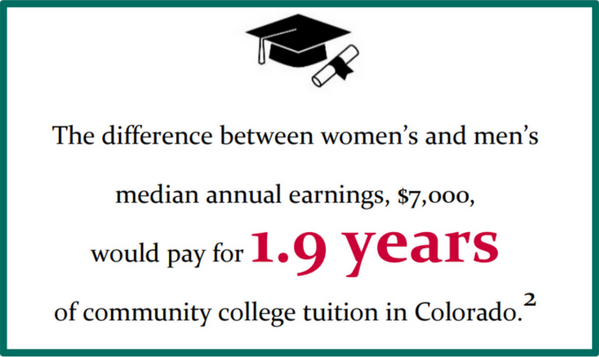 The report shows some signs of economic progress for women in Colorado, but unfortunately, substantial disparities remained or even worsened since IWPR’s research in 2015. White women’s earnings compared to white men’s earnings improved from 77.1% to 78% between the 2015 and 2018 reports, but the earnings gap has worsened since 2015 for Hispanic (53.8% to 53.5%), black (65.5% to 63.1%), and multiracial women (68.1% to 63.7%) in comparison to white men’s earnings. Since the 2015 report, the proportion of Colorado women living in poverty increased to 14.3% from 13.0%. The poverty rates increased slightly for white, Asian, and multiracial women between the 2015 and 2018 reports, and nearly doubled for Native American (11.4% to 21.1%). Poverty rates decreased slightly for Hispanic and black women, although 20.9% percent of Hispanic and 19.2% of black women still live in poverty.